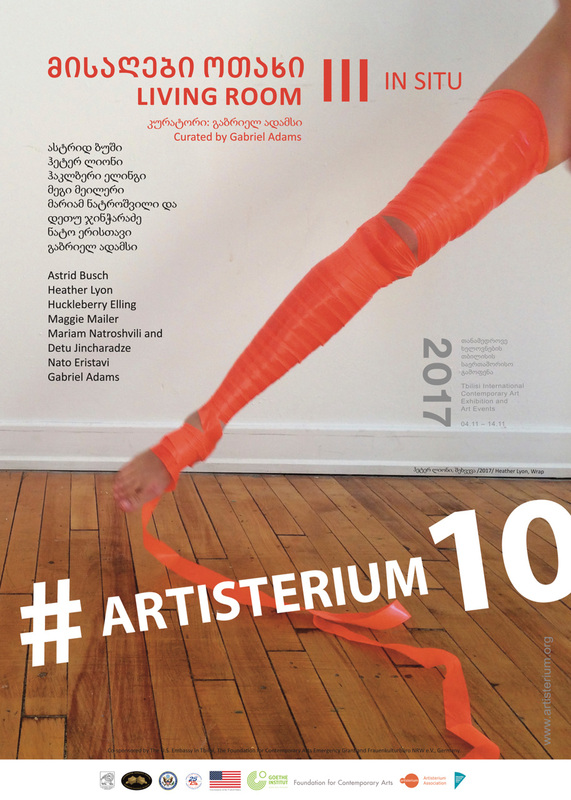 Scissor Language is an installation I made in November 2017 in Tbilisi, Georgia, as part of Artisterium 10, Tbilisi 10th Annual International Contemporary Art Exhibition and Events. Given such a weighty Exhibition title, I aimed for a bit of levity, and made an installation that combines the language of painting, demographics... and laundry. Our umbrella project, called Living Room 3, curated by Gabriel Adams, is part of a series of Living Room exhibitions which mix "lounge, workshop, performance and game space in an experimental setting." The idea is for artists to gather in an international location, respond to the site, and make work on the spot. The installation began as an idea about the overlap between the painting process and geopolitical activity. I was partly inspired by Georgia's alternating history, going back centuries, of annexation and independence. But idea was rooted in a shift occurring within my painting habits over the last year. Up until that point I had been making fairly representational landscapes, working with transparent paint, vague edges, few straight lines, and a deliberate multi stability of forms. At a certain point that coincided with a move towards abstraction and its inherent uncertainty, I started leaning towards flat paint, clearly defined spaces, and hard edges, and began to notice some overlap between my newfound painting habits, and the language of political unrest. Borders, Edges, Takeovers, Revelations: there is real power in defining an edge with a bold line, or painting out a section that isn’t working, with flat, opaque paint. Building a Painting/the Demographics of Tape/Studio Wall 2017. The question formed: to what degree are my painting habits resonating with events happening on a global scale? Could defining an edge within a painting space be motivated by a miniature appetite for control, but one still on the same spectrum as that of a ruling power imposing its will on a neighbor? Are straight lines compelling because they don't exist in nature? And is painting over a successful painting (because I changed my mind) taking a necessary risk, or a waste of paint--and might this habit, this need for newness, be a bit like a military occupation? Without making light of the real lives of people affected by such maneuvers, I'm curious about what gradations of power actually look like, and if the way that power appears in an innocuous context, such as painting, actually has echoes in a larger, global context. I imagined Scissor language as an attempt to cut through the linearity of borders, edges, time, to the territory of presence embodied in the act of painting. Presence, freedom, all at once-ness vs the linear form of clothesline, tape, and hallway. The reference to laundry and clothesline performs a connecting role: the quotidien chores to which we are all bound; the grounding element in a life, and the through line of daily, practical activity that unites people across borders. The actual installation became a diagram of its own evolution. 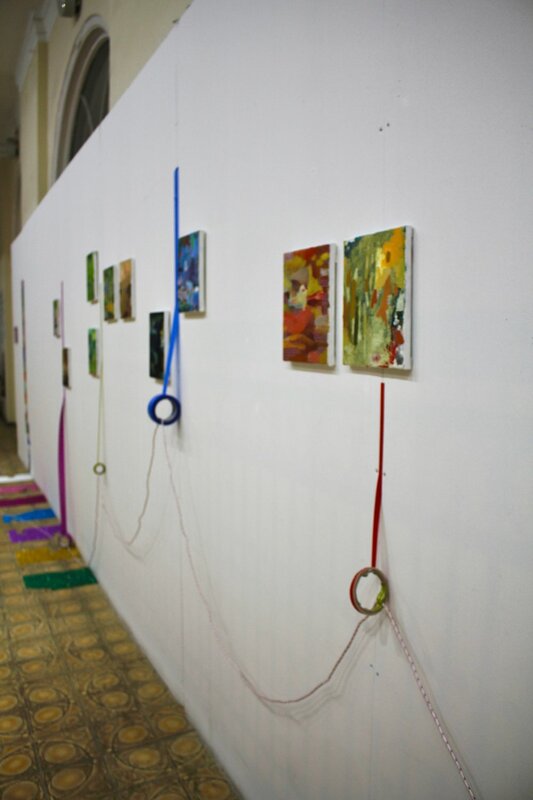 Walking the length of the hallway is to enter a timeline of my process and week in Tbilisi. The installation begins with an unopened clothesline mounted on the wall; a functional object transformed into a presence worthy of contemplation; a reversing of the quotidian (laundry) into a kind of beautiful object hood. And a form of potential, of linearity bound up. Following is a vertical line of drawings that connects to a series of glitter paper paintings on the floor, sections cut out, and arranged with even gaps in between to reveal an arabesque tile floor pattern. The linear placement of drawings and glitter paper are a nod to the linearity of the hallway and an attempt to enter it; to speak its language, and so enter—perhaps a form of soft diplomacy. On the floor a new clothesline begins its traverse along the expanse of hallway. It travels to the middle section, where it climbs the wall as it approaches a series of abstracted landscape paintings, floating among and separated by rolls of colored tape (painter’s, electrical, decorative, and sports tape) which define the borders of open sheetrock lining the hallway. The clothesline moves through the rolls of tape, as if engaging in the refining process that the activity of painting demands. And at the same time, maintaining, insisting always on it’s own linearity- the linearity of time that wants us to continue moving, to get on with the day, to reject presence. At the end of the hallway the clothesline finds its intended purpose, and rises to clothesline height against the wall, where it supports a length of muslin that extends 24 feet across the floor (more linearity) to land in a lavender laundry basket filled with scissors, a roll of purple glitter tape hanging off the edge. Here is the culmination of the week: it is a moment of renewal, as suggested by the theme of laundry, and a washing away of color encountered earlier along the hallway, in favor of raw muslin. The Exhibition Opening Deadline (my deadline to produce work) is marked by a set of ten scissors inside a laundry basket. Finally, a roll of purple glitter tape marks the endpoint of the installation, with an invitation to continue: an invitation for the viewer to cut off a piece of tape to wear/annex as an extension of the installation. In this action, the viewer is taking the installation with them, and dissolving the boundary of hallway/painting space/exhibition territory. Migration, globalism, transience - but also a renewing of the creative process, a relay handoff of creative agency from the artist to the viewer. I want to understand the connection between my painting process and the artificial disasters of our age: oil-spills, fracking, nuclear meltdowns, political upheavals. The motif of these events appear spontaneously as I work, in a literal sense as imagery, and metaphorically in my handling of the paint. I’m curious about moments when the creative process implies destruction: erasing a mark that doesn't work, leveling a surface to prepare it for the next layer, painting over areas that no longer function in the context of a given painting. Within the world of painting experience, these moments are innocent ones, yet structurally, how much do they differ from the violations enacted upon the natural landscape by a culture’s need for expansion? To what degree are my painting habits influenced and driven by the cultural assumptions we all navigate? I include a roving set of art historical references that seem to have no internal relationship, as if their very nature is an escapist one: 18th and 19th century paintings of women and landscapes, Comic book and cartoon imagery, Tibetan Tangka paintings, Flat color, Rebuses, and Yantras. Unable to find ground in the attempt to make sense of these disparate themes, the viewer is confronted with a kind of conceptual floating. Like dreams, or perhaps the nature of things, I’m interested in imagery that lives within broken spatial orientations. I see vertiginous pairing of color, and forms that do not converge, as analogs to ideas that do not converge, to cultural assumptions that clash. These paintings hope to disrupt the viewer’s psychological code that defines what center in the body (physical, emotional, conceptual) will automatically interpret a visual cue. And within the disruption, signal the ability to float. I thought of this show a little bit like the United Nations, in that I’ve been entertaining the notion that if I could get conflicting attitudes about painting to coexist in the same body of work, they might suggest a state of reconciliation that would, perhaps, bode well for us collectively. With this in mind I set out to include all the influences that felt most relevant to me right now: comic books, cliffhangers, painter’s palettes, rebuses, yantras, the floating world, and 19th century romantic landscape painting. that’s a lot to pack in, but there’s a reason for this excess, which I hope to get to later. Here's an image of how I conceived the show: these are post it notes attached to sono tubes, (which are building tubes for constructing houses, and are also used for shipping paintings). the post-its are like throw away thoughts, and were a way to literally build the show conceptually. When I was first putting Floating World together I was originally going to call the show Cliffhangers. For one, I thought it would be funny, because no one is really too concerned or panicky about the fate of a particular painting, or Painting in General. Unless you happen to be a painter, in which case you know the relative importance of every mark or brush stroke. Then you understand the razor’s edge of decision making in painting, knowing, for example, that every color applied will alter the existing colors on the canvas, and every mark will show up the pre existing ones as true or false moments. This seems to be a moment in political and cultural history in which we've collectively become familiar with the idea of disaster. And yet there is an ongoing sense of unreality; the media is more akin to reality television, with a constant Cliffhanger quality to the news. The emotional undertone of the paintings in Floating World is my way of responding to daily news that is impossible to digest. One of the themes I obsess about at this moment has to do with the way we make disaster cute, or palatable, in order to get on with our lives. Back in 2011 when Fukushima became a household word, I remember wondering how I could celebrate my 40th birthday in light of the news, which had occurred within the same week. Five years later I’m still wondering about this phenomenon. Fukushima, Mon Amour, one of the darkest paintings thematically speaking, has the brightest colors. Of more interest to us as painters, there is the notion of what I think of as the cliffhanger within the painting process: that moment which occurs whenever a flat shape meets up with another shape, and a kind of visual falling off occurs: you reach the edge of one space and hit the edge of another, with no transition. If you’re trying to describe continuous space, but can’t summon the ability to pull it off that day, for whatever reason, then you know this moment. Then there is the deliberate act of creating discontinuous space, of reminding the viewer that they are, after all, looking at a flat image, which is something painters have been doing for a long time. I’ve come to think of these moments, in which you seem to reach the edge of an idea, as Cliffhangers.